The Markilux 791/891 is the drop arm awning with autolift arms. Autolift arms allow the window awning to offer more headroom as once the awning is extended, the arms automatically slide up the siderails therefore producing more headroom. This awning commends high Markilux quality. When retracted, the awning is fully encased within the cassette which provides an elegant appearance with a high level of protection for the awning material. This drop arm retractable window awning’s casette is just 4″ in height and constructed using extruded aluminium. The high quality of Markilux technology means the spring-assisted closing mechanism closes the cassette automatically when the window awning is retracted. Tensioning springs are implemented into the arms to enable friction-free movemen and guarantee a taut awning cover every time. The Markilux 791 & Markilux 891 retractable drop arm window awnings are custom-built according to your precise ordering measurements. They have a maximum width of 23ft with a drop of 8.2ft. This window awning can be installed for use with manual or electric operation. Manual operation consists of an interior gearbox and universal joint, whereas the electric motor uses remote control operation. Electric operation offers ease and convenience. 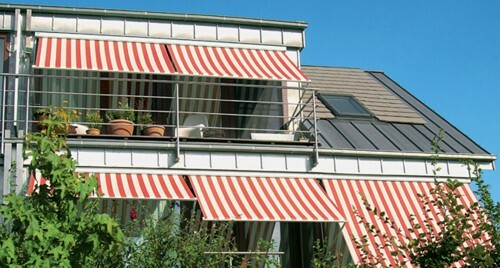 The Markilux 791 & Markilux 891 awnings are available with over 200 unique, high-tech fabric cover selections. Ranging from lightweight Sunsilk Self-Cleaning fabrics to super sun-shading Transolair cover, there is a cover for all purposes. Click here to view the awning covers. Markilux 791 & Markilux 891 – What is the difference? The only difference between the Markilux 791 and Markilux 891 drop arm retractable window awnings is the cassette profile. The Markilux 791 has a squared cassette profile whereas the Markilux 891 has a stylish rounded cassette profile.